Just before his ascension, Jesus commissioned his apostles to continue the work he had begun. “Ye shall be witnesses unto me, both in Jerusalem and in all Judea, and Samaria, and unto the uttermost part of the earth“. (Acts 1:8) The book of Acts shows how the work progressed. Persecution, initiated by the Jewish Council against the infant congregation, caused them to flee through Judea and Samaria, which effectively resulted in the light of the Gospel being taken to other areas (Acts 8:1). Jesus, realising that his disciples were not yet equipped to the task before them, promised the gift of the Holy Spirit as a “teacher” and a “remembrancer” (John 14:26) to guide them into all truth (John 16:13). It also confirmed the work as being of God, by signs and miracles. The gift of languages enabled the preaching to be undertaken immediately, as the Jews at Pentecost found to their amazement (Acts 2:5-11). Thus the Holy Spirit would guide the teaching and establishment of God’s Truth in communities or ecclesias. This is clearly explained in Ephesians 4, where the apostles and teachers are equated to those God separated to be teachers in Israel of old. There had been two outpourings of the Spirit, at Sinai when Israel was constituted a nation, and now at Pentecost, when believers were called out to form the ecclesia. Ephesians 4:8 quotes from Psalm 68 which recounts the events that took place at Sinai. At Sinai “God gave the word” (Psalm 68:11). At Pentecost, God “gave apostles, prophets, evangelists, pastors, teachers..” The spirit teaching work was to edify and build up the immature body of Christ till maturity was reached (Ephesians 4:12-16), and the body “fitly joined” could operate in fulness. Once this was achieved, and the books of the New Testament were written by Holy Spirit guidance, the Holy Spirit gifts were no longer needed. “When that perfect (state) is come, then that which is in part (the various gifts) would be done away” (I Corinthians 13:9). The word “perfect” is in the neuter gender, and so does not refer to a person. Apostles were appointed by Christ personally. There is no modern counterpart to the position of apostles (Acts 1:20-23). The apostles chief function: to preach the Word of God. They refused to act in the “daily ministration”. Later Paul instructed that selection of ministers was to be made on the basis of a personal godly character (1 Timothy 3). This resulted in believers being subverted, as was Eve from the way of God (2 Corinthians 11:2-4,13). It was the story of the Garden of Eden all over again! The Greek philosophy of the world began to make inroads into the Hope of Israel (cp 1 Corinthians 1:20-24) and as Paul warned “the time came when they did not endure sound doctrine” (2 Timothy 4:3). 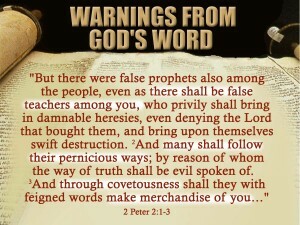 Peter’s warning, showed that the defection would be widespread, and would result in a religion of “merchandise“, of power and property. (2 Peter 2:1-3) Ultimately, a church arose with political interests who persecuted the true believers (Revelation 12:17; 13:4-8). This corruption of early Christianity is acknowledged by historians. Augustine (c396) a “church father” assisted in this corruption. “His mind was the crucible in which the religion of the New Testament was amassed completely fused with Platonic tradition of Greek philosophy; and it was also the means by which the product of this fusion was transmitted to the Christendoms of medieval Roman Catholicism and Renaissance Protestantism” – Encyl Britannica.